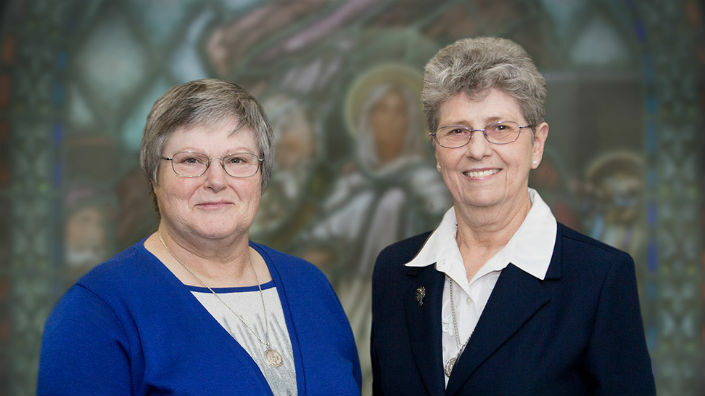 Dignity Health – St. Mary Medical Center welcomes two new Sisters of Charity of the Incarnate Word, who will continue their 93-year tradition of caring and compassion at St. Mary. Answering Bishop Dubuis’ call to help care for the needy, sick and infirmed, three nursing sisters from France became educated in the spirituality of the Order of the Incarnate Word and Blessed Sacrament founded by Jeanne de Matel, a 16th century mystic. 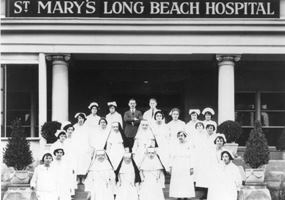 Arriving in Galveston, the three founding sisters opened the first Catholic hospital in Texas, St. Mary’s Infirmary, in 1867, and began a ministry which thrives today. Over the past 150 years, the Congregation spread its ministries both far and near, including El Salvador, Guatemala, Kenya, Ireland and other parts of the United States. Besides caring for the needy, sick and infirmed, the Sisters have expanded their ministry to promote the totality of human life, including the fundamental dignity of individuals. They remain committed to their founding call while constantly adapting to meet the evolving needs of society in areas of Spirituality, Health Care, Care for the Elderly, Education, Adult Literacy Programs, Children, Young Adults Outreach, Corporate Responsibility and Social Justice. From large sophisticated health systems to small dispensaries in remote villages, the Congregation spreads the healing ministry to those in need. In the United States, they co-sponsor two of the largest Catholic health care systems in the nation: Dignity Health and CHRISTUS Health. They support the AIDS ministry of the Archdiocese of Galveston-Houston. In Ireland, Carrigoran House provides for the needs of the elderly, while St. Martin de Porres Dispensary in Kenya delivers primary care services, including to those clients who are HIV positive or have AIDS. In Romania, the Sisters support and collaborate with those who lovingly care for a multitude of children diagnosed with AIDS, with nearly 1,000 children receiving care annually in the outpatient clinic of the center. In 1986, with a generous grant from the Sisters, the Comprehensive AIDS Resource and Education program (C.A.R.E.) began in Long Beach at St. Mary Medical Center, in order to comprehensively address the medical, social and mental health needs of those infected or impacted by HIV/ AIDS. Since its inception, C.A.R.E. has become the “gold standard,” providing HIV specialty care and services to Los Angeles County residents who turn to it —regardless of their ability to pay. The C.A.R.E. Program provides a full spectrum of services from treatment, support, and education for the newly diagnosed, as well as providing care for long-term survivors. The Sisters have consistently supported this program over its first 30 years, and their commitment to those affected by HIV/ AIDS is historic. But, the Congregation is anything but static. As the needs of society evolve, so do the ministries of the Congregation to meet those needs. With the terrible scourge of human trafficking on the rise, they support – among other similar organizations – United Against Human Trafficking in Houston, a non-profit organization dedicated to combating human trafficking in all forms and ages through education, public awareness, and empowerment. From 1866 to 2016, the Sisters of Charity of the Incarnate Word have had a profound impact on the spiritual and physical lives of countless individuals, all over the world and in our corner of it here in Long Beach. They continue to carry out their founding mission, and the proud legacy of the first three Sisters setting foot in the heart of Texas in 1866 has continued to be a source of strength and inspiration to us all.